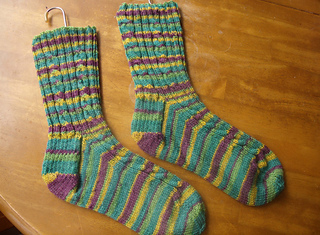 Like many sock knitters I have a love affair with self striping sock yarns. 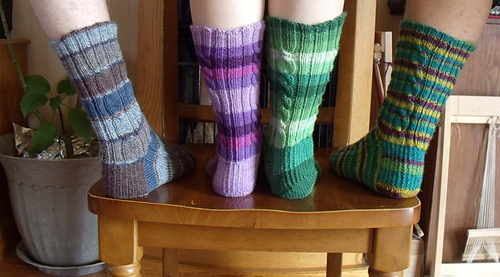 But sometimes I want to do more than just knit around and around, but also don’t want to carry a complicated pattern around with me, or count rows between cables. By using the spelling mnemonic “I Before E, Except after C” I came up with a way to make any self striping yarn create its own cable pattern. Of course, as we all know there are lots of exceptions to that spelling rule, so I added those in too! 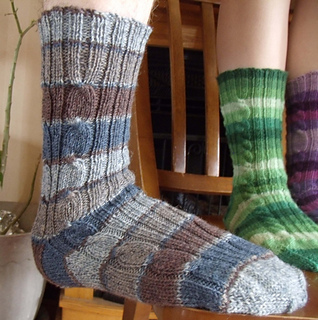 Read the “How it work’s” section, then jump right in and let your favorite striped yarn create the pattern for your socks. 5 variations on the “spelling rule” are included. 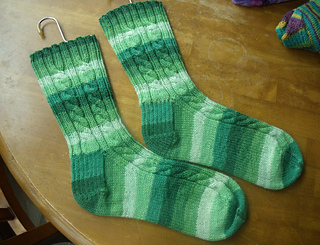 Designed specifically for self striping sock yarns the pattern is explicit enough for a first time sock knitter, yet also allows an experienced sock knitter the freedom to pick their own toe and heel if they have a favorite. 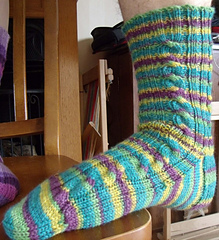 It is written for a cuff down sock, however if you have a favorite toe up method the pattern stitch looks fine the other way up! 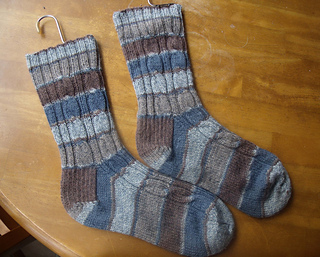 You will need stitch markers, a cable needle and a large eyed tapestry needle.